Pebble Beach: A great swimming area with incredible views! Launch your kayak or your board from here and avoid the crowd at Bob’s Beach! 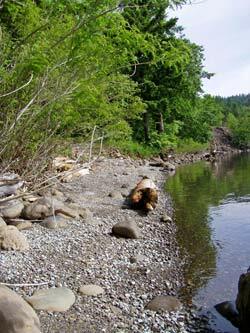 Take in the sights, relax, and enjoy the variety of pebbles and driftwood. Directions: From Portland take I-84 east to the Bridge of the Gods exit #44; Cross bridge to Washington SR14, turn east, 3 miles to Stevenson; Turn right on Russel St., cross railroad tracks. Stevenson Landing is straight in front of you. Turn left and follow the road to the parking lot at the Boat Launch. Use the walking paths to the east of the parking area.